A graduate of the Juilliard School, Ms. Coffland made her Festival Opera debut in 2015 in Ariadne auf Naxos, and returned this season in Love, Lust & Laughter. 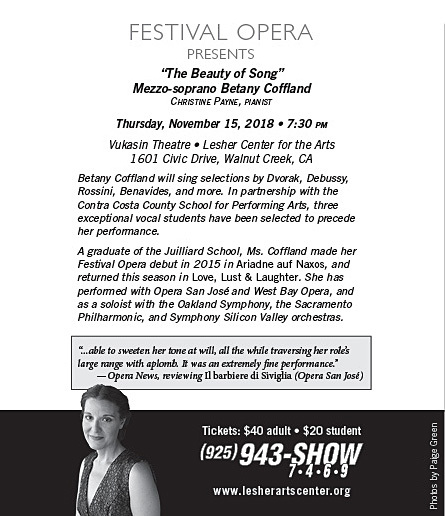 She has performed with Opera San José and West Bay Opera, and as a soloist with the Oakland Symphony, the Sacramento Philharmonic, and Symphony Silicon Valley orchestras. For tickets, call 925.943.SHOW, or visit the Lesher Center Ticket Office, either in person or online.